The 2013 Cadillac ATS compact luxury sport sedan is high on luxury and that’s what you would expect from the brand. But the 2013 ATS also delivers an exceptional amount of sport due to its performance technology that is measured against the world’s best luxury sports sedans. Cadillac engineers developed the ATS’s sport-tuned suspension and added a component they call Performance Algorithm Liftfoot, or PAL that provides improved acceleration control and handling through the curves during spirited driving. Cadillac engineers tested and refined the new component and other performance features on the ‘Green Hell’, Nurburgring’s Nordschleife course. In order for the new ATS to be considered worthy alongside the world’s-finest sport sedans from Germany, the luxury brand from GM put the new ATS through rigorous testing on tracks around the globe. Cadillac is on the right track and in a recent Motor Trend comparison of the world’s sportiest six-cylinder sport’s sedans, the ATS came out on top as the overall winner. It’s been described by other driving enthusiasts as “a blast to drive on the road and track.” For one who has driven the car, it’s a very good evaluation of how the car performs. The performance component called PAL, will automatically detect when the driver needs more performance from the sport sedan when coming out of a corner and drops the transmission to a lower gear to improve acceleration. The PAL component is paired with the ATS’s six-speed automatic transmission to provide the quick-shifts needed for extra spirited driving on the track. This allows the driver to give full attention to the road and provides a fun exhilarating driving experience. Since most buyers are not professional drivers, this is an ideal performance enhancement on the ATS. For those who want to shift on their own, a six-speed manual gearbox is also available. 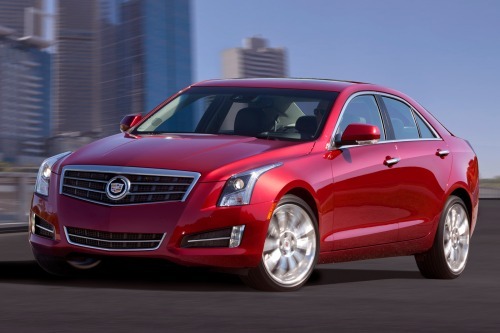 The 2013 Cadillac ATS can be ordered with a 2.0-liter turbo or a 3.6-liter V6 powerplant that delivers 321 horsepower for the maximum power. The ATS can be ordered with rear-drive or all-wheel-drive and features a sport suspension where the driver can select the “Sport” mode for more spirited driving. The computer then knows to command downshifts to ensure the right gear is readily available. This aids the driver in combination with the Brembo brakes being applied heavily to maintain control through the turn. When less aggressive driving conditions are detected, the transmission will upshift sequentially through the gears, and exit PAL mode. The ATS also features a lightweight chassis that leads to better acceleration and handling. Cadillac is taking on the best performance sedans in the world and with the new performance technology, the new 2013 Cadillac ATS is gaining ground quickly on the competition.